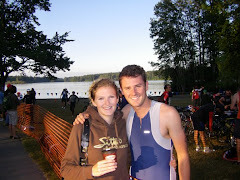 Mj's Tri Blog: It's Been a While! Wow it has got to be at least a month since my last post. Here is an update on what is going on with my training/life right now. My new job is fantastic! I work with great people and being a "banker" is a pretty entertaining profession right now. I just nailed a presentation on the economic forecasts of the main economies HSBC invests in, and I love the people I work with. On the training front, it has been an enjoyable challenge to adapt to my new "adult" lifestyle. Seriously, I have a new respect for the average 30-49 y/o (I don't include those over 50 cause I think they have a little more flexibility in their work schedule) triathletes. Last year I had 6 classes while writing a thesis and training & working full time, but I was still able to get away from class for an hour or two to join a group at the pool or track. Now that I am part of a large corporation, there is no wiggle room at all during the day. I get an hour lunch, but with no showers available at work it would just be a waste of time to try and get anything remotely productive done. And when I get home from work I am friggin exhausted. I don't want to sound like I never knew that before, because I did. The biggest difference from last year when I was training and working full time was this. When I was working as a bartender with later hours, I was able to give all of myself to my daily training, and drag my tired and sore body to work and slug it out. Now it's the opposite. I give the best and strongest part of my day to work, and slog out a workout after. That being said, I have been enjoying my training lately. I am hitting both the PIH Tuesday night workout as well as the Lifesport Saturday workout, in order to get two solid interval sessions per week. I am also doing some unstructured runs a few days a week as well. I am going to the pool at least two days a week and am really enjoying it. Sure it's pretty hard to get motivated to go, but I am having fun doing 2km sets with a little hard interval sesh in the middle. I still do all my drills and pickups, and try to get 500-750m of intervals before some kicks and pulls. I feel that 500-750m is perfect for me right now. It really gets the heart up, and allows me to hit some pretty solid lap times. I know I would not be able to keep that pace for any longer, but it allows me to feel good about myself, which makes me keep wanting to come back! I have even been getting out on the bike! The last few times out I have been challenged by riders that I just run into, which has made for some pretty fun riding! All in all, I am working out right now because I love working out! I am trying to get back into shape, but not putting so much pressure on myself. Last year I knew that I would probably only have one year to try and excel seriously as a triathlete before my career began, and I felt pressured to excel as fast as I could. Now I am relaxing more and enjoying the improvements when they come. Wow that was a long post. Hopefully that is enough for a few weeks.